I am really interested in complete “cycles” presented by natural materials, and their usefulness to communities aiming to live sustainably. These cycles are varied and may be the process from a calf being born to a pair of leather shoes, or a lamb to a woolly jumper. 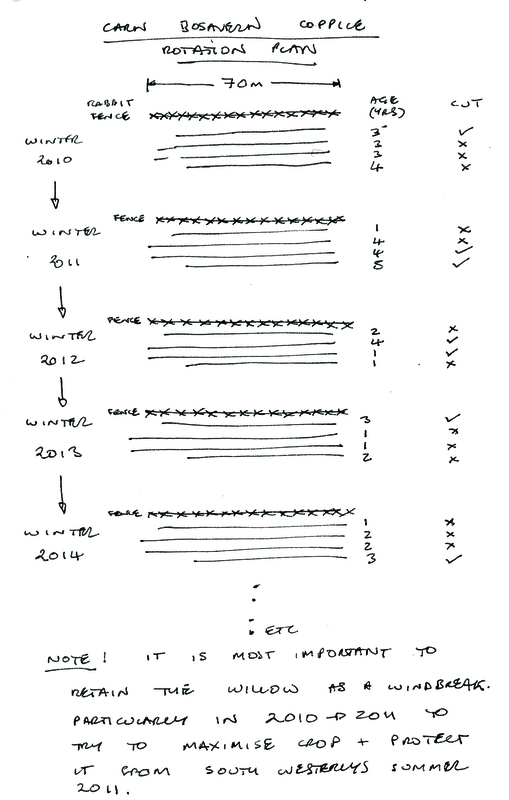 The cycles I am currently focussing on are those presented by trees. 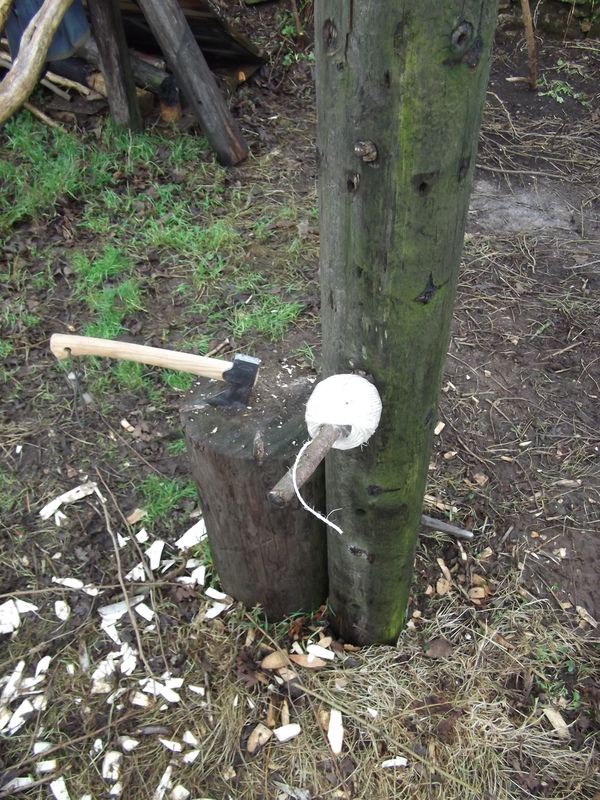 I am exploring this at Plan-It Earth education project ( http://www.plan-itearth.org.uk/) as part of a long term residency by setting up a green woodwork space, coppicing willow and hazel they have growing there and then seeing what we can produce from the natural materials. This will hopefully provide a forum for people interested in the many crafts associated with these trees, present opportunities for passing on some of these skills to interested people and also create ideas for generating new income streams for Plan-It Earth and the local community. 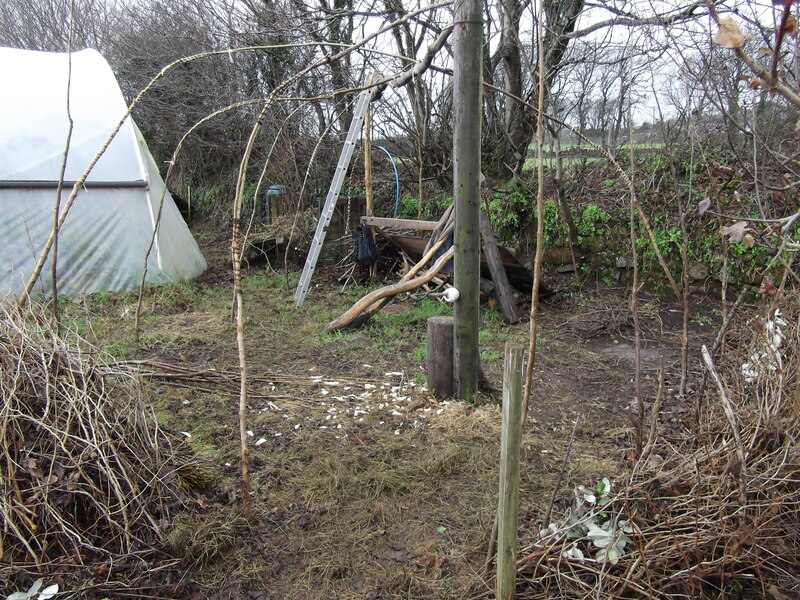 The first thing to do is to set up a sheltered space suitable for working with green wood. 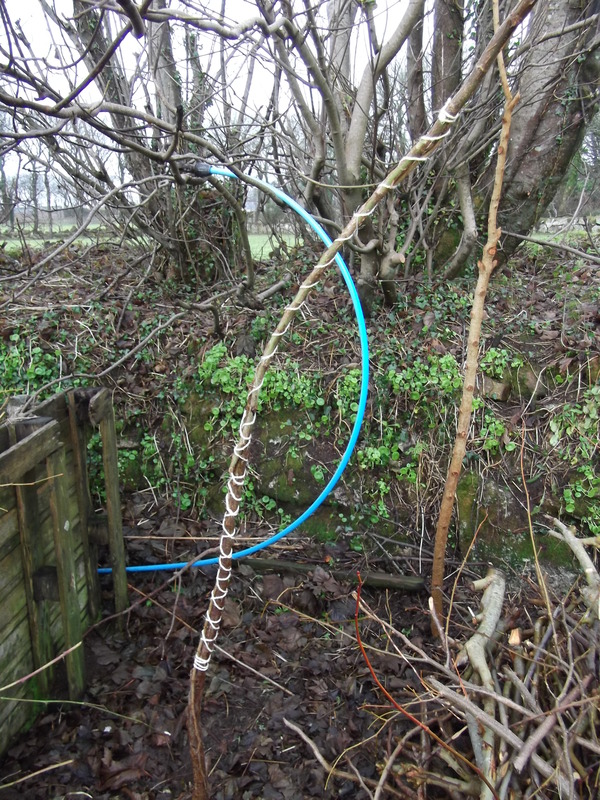 Here I am using 2 – 3 year coppiced (bendy and overgrown!) hazel tied together for the vertical uprights of a bender frame. 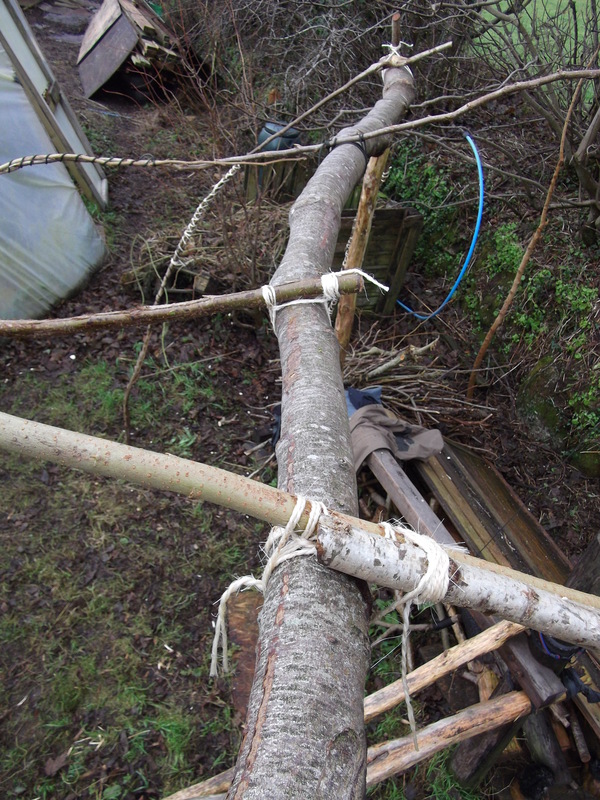 This will be ringed with thumb thick hazel rods tied at 90 degrees to the verticals to provide stability and strength enough to cover the frame with canvas tarpaulins.It is very important to me to use materials found ‘on-site’ to create this structure. 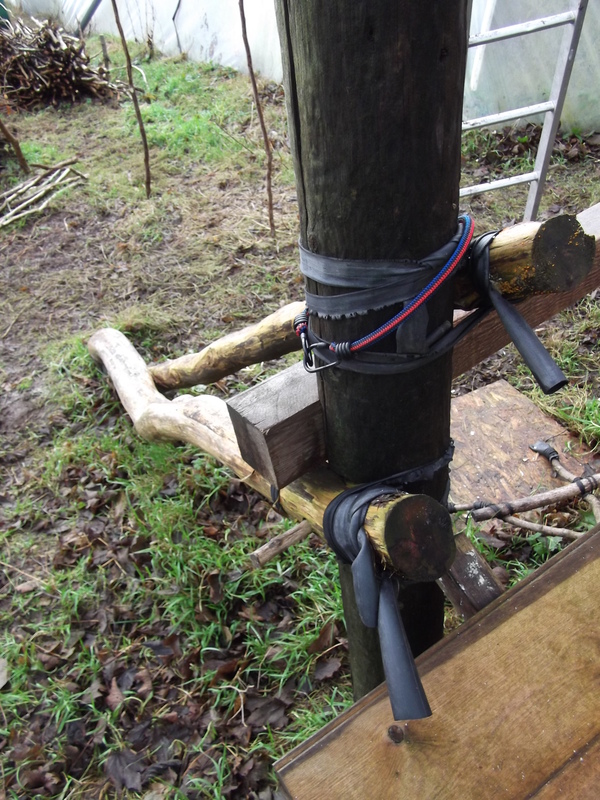 The goalpost uprights (for the main supporting structure) are made from an old telegraph post, the crossbar made from a fallen sycamore trunk found in the road. Chopping Block and handy string holder! The goalpost arrangement used as the main supporting structure for the verticals is also used as the pole lathe supports at one end. A brake is also positioned to come from the pole lathe uprights. ‘Brake’ running off pole lathe bed. Note: The brake is pegged and also tied temporarily with rubber inner tube. The verticals were also lashed to the “crossbar” of the goalpost as the poles were not long enough to go over. Hazel verticals lashed to crossbar. The knots used to tie the poles together were simple slip knots finished with 2 half hitches or a hunters hitch using sisal string. Tying two poles together for verticals. 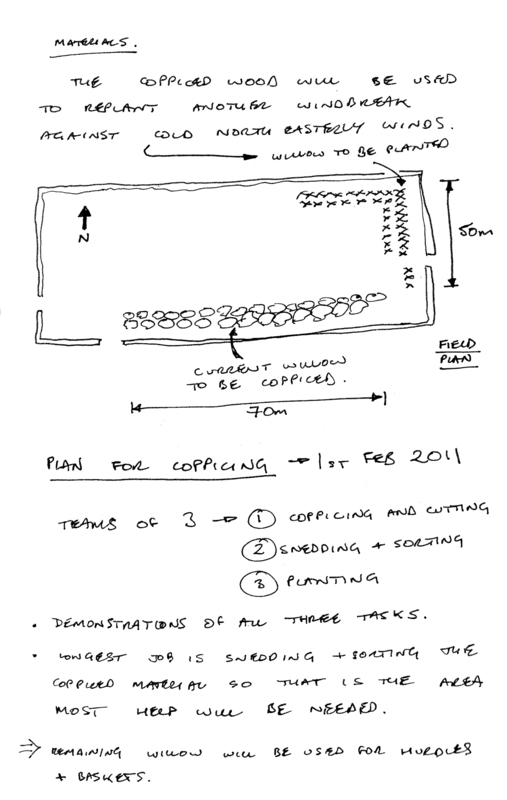 You are currently browsing the Greg Humphries blog archives for January, 2011.